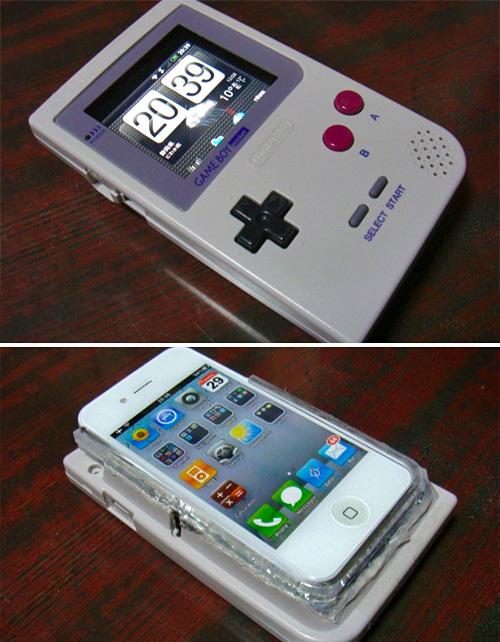 Unholy Mashup Of A Game Boy, An HTC Android Phone And A Fake White iPhone 4 Is The Must-Have Convergence Device Of 2011 | OhGizmo! By Andrew Liszewski on 12/29/10 • Leave a comment! Forget about whatever’s going to be revealed at CES next week, we’ve already found the must-have convergence device for 2011. For no other reason than it was obviously the right thing to do, modder ‘goteking‘ created this, um, useful mashup of an HTC Android phone, the shell of a Game Boy Pocket and a fake white iPhone 4 that’s been enhanced with a an internal set of LEDs that show through the housing as they light up to display messages and animations. Sounds pointless right? Well this video of it in action will 100% confirm that. Obviously you can’t put a price tag on such innovation, but if you check out goteking’s site I’m sue you can glean all the materials necessary to build your own.